With the fanfare of the opening ceremonies over and the Olympic flame now burning brightly, athletes from the 200 countries participating in the Sydney Games got the competitive fires burning on the first full day of competition. And an American fired the first salvo  literally. Nancy Johnson captured the first gold medal of the Sydney Olympics, shooting her way to victory Saturday (Friday night EDT) in the women's 10-meter air rifle. "Winning the first medal - that's pretty cool," said Johnson, whose father first took her to a shooting range at age 15. "It's extra special, no doubt." Johnson's gold medal triumph came just hours after the extravagant four-hour opening ceremony. While the 26-year-old Johnson was winning, the women's triathlon was making its debut as an Olympic sport - and Australia's Michellie Jones was capturing the host nation's first medal. In a terrific one-on-one finish, Brigitte McMahon of Switzerland outlasted Australia's Jones in the grueling competition. McMahon was the winner by two seconds when the pair reached the finish line at Sydney Opera House. 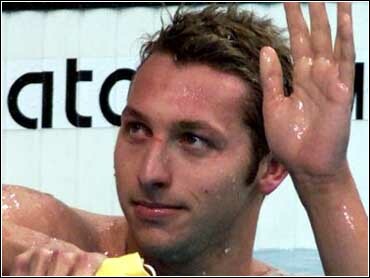 Australian swimming sensation Ian Thorpe made a big splash in his first event, setting an Olympic record amid the type of adulation usually reserved for rock stars. The 17-year-old Australian was top qualifier in the 400-meter freestyle preliminaries while breaking an 8-year-old Olympic mark. "I was pretty happy with the result there," said the teen dubbed the "Thorpedo." Americans Chad Carvin of Laguna Hills, Calif., and Klete Keller of Phoenix, also advanced to the eight-man evening final. The duel between American Jenny Thompson and Dutch swimmer Inge De Bruijn started with a bang, as Thompson set an Olympic record in the 100 butterfly preliminaries only to see De Brujin eclipse it minutes later in another heat. The record had stood for eight years. "I was really pleased with my time," Thompson said. "I was controlling myself emotionally. I'm feeling good and strong and relaxed." Earlier at the Aquatic Center, two Americans qualified Saturday (Friday night EDT) for the women's 400-meter individual medley - Kaitlin Sandeno and Maddy Crippen. Sandeno, the 17-year-old known as the "Energizer," posted the third-fastest qualifying time in the preliminaries. She's hoping to give the United States its first gold medal in the event since Janet Evans in 1988. Crippen was the eighth and final qualifier. The U.S. boxing team, hoping for its best showing since Seoul in 1988, took its first step in that direction when 119-pounder Clarence Vinson scored a one-sided decision over Rachid Bouaita of France. Vinson, of Washington, D.C., landed the last eight scoring blows in a 9-2 decision. The most notable U.S. boxer in Sydney only made it to ringside: Muhammad Ali, who showed up at the boxing venue during another bout. The ex-heavyweight hampion hugged an old foe, Joe Bugner, who was working as a boxing commentator. Bugner, who now lives in Australia, lost to Ali in 1975. In beach volleyball, Holly McPeak and Misty May of the U.S. easily dispatched the Czech duo of Martina Hudcova and Tereza Tobiasova in a 15-5 rout. Sadly, International Olympic Committee president Juan Antonio Samaranch, presiding over his last games, had to leave Sydney to visit his ailing wife in Barcelona. Maria Theresa Samaranch was suffering from an undisclosed ailment. IOC director Francois Carrard, who announced Samaranch's departure, provided no other details. "This is a private matter for him and his family," Carrard said. "It's not possible for me to say today when he could come back. But he made clear he does intend to come back to the games as quickly as he can."